Phenolics are organic chemicals in grapes and wines which are responsible for its taste, mouthfeel and color. There are literally thousands of different phenolic molecules, some small, others very large, some have simple organic structures, others are very complex. They constantly interact with other chemicals and with each other, as grapes grow, during fermentation into wine and during cellaring. These chemical processes are very complex and not yet fully understood. The most important classes of phenolics in red wine are tannins and anthocyanins. Anthocyanins are water-soluble pigments extracted from the grape skins. They interact with themselves and with other colorless compounds to create color beyond what could be expected from themselves. Anthocyanins represent a family of different compounds. Their concentration is measured in ppm of Malvidin equivalents. Tannins are also water-soluble, but they are extracted more slowly from the skin, seeds and pulp. They impart an astringent character to the wine. Tannins concentration is measured in ppm of Catechin equivalents. Bound Anthocyanins result from the combination of Anthocyanins and Tannins. They are stable polymeric pigments and thereby provide color stability to the wine. Concentration of Bound Anthocyanins can be measured by absorbance at 520 nM. Mature cabernet sauvignon grapes contain around 3.5 mg per grape of tannins – of these approximately 58% are in the seeds, 38% in the grape skins and 7 % in the flesh – all very different in structure and size. During fermentation different proportions of these seed, skin and flesh tannins get extracted and combine with anthocyanins (which are also present in the grapes). Later on these chemicals continue to interact with each other and with the tannins and other chemicals in wine-barrels. Typical Cabernet Sauvignon wine has around 700-1000 mg/L in tannins and 800-1100 mg/L in anthocyanins (concentrations are higher for Petit Syrah and lower for Merlot, Zinfandel and much lower for Pinot. . While we know very little about chemical processes, progress is being made. In 2006 scientists at UC Davis in cooperation with the Australian Wine Research Institute published papers describing how to measure the amount of phenolics and anthocyanins (not their composition!) efficiently enough and, almost in real time, to measure the effect of different winemaking techniques on the creation of tannins and anthocyanins. The methodology is based on measuring the ultraviolet spectrum of wine, and correlate the results with phenolic compositions of similar wines which have been analyzed using wet lab chemistry (the Harbertson-Adams Assay).This methodology has since evolved into 2 commercial applications: One is the Tannin Portal created by the Australian Wine Research Institute which sells representative spectral data to analytic laboratories and large wineries so they can compare the spectra they measure locally (see this link). The other is a platform created by a commercial startup called WineXRay. Typical levels for 2012 vintages of different grape varieties are shown in the table to the right (extracted from a WineXRay presentation). Clearly the typical phenolic and tannin levels vary greatly across grape varietals. Place the flow-through cell in the “B” position (Starna Quartz Flow Cell 0.2mm; cat. # 584.4-Q-0.2). Using the sipper Fisher Scientific Model 72-310-080, flush the flow-through cell with DI water for two to three minutes. Place the flow-through cell in the “1” position, and click on the “Measure Sample” button. A Sample Information window opens. Type in “yyyy-mm-dd hh.mm baseline” and click “Measure”. The Sample Information will open again on top of the VisionLite window; click Close. Click Autoscale under the spectrum graph. Assure that all the absorbance readings are less than 0.005 AU. A typical baseline spectrum is shown below. In case the absorbance readings are greater than 0.005 AU, flush the flow-through cell in the reverse direction using the cell-cleaning solution followed by DI water, and repeat steps 3 and 4. The system is now ready for measuring the spectra of the wine samples. Use the sipper unit to prime the flow-through cell in position “1” in the spectrophotometer with the wine sample. Fill in “yyyy-mm-dd hham/pm csv 2009 refer” if the sample is the reference wine; “yyy-mm-dd hham/pm samplename” if the sample is the test sample. Then click the “Measure” button. The spectrophotometer will now measure the sample’s absorbances at wavelengths from 200nm to 900nm. When complete, the Sample Information window will open on top of the VisionLite window; click “Close”, then click the “Autoscale” button to see the full spectrum. Examine for reasonableness. Click File, then Save Spectrum to save the spectrum data twice, first in dsp format then in cvs format in a folder on the laptop labeled with the date of the test sample. Rinse the tubes and the Flow Cell with the sipper using DI water for 30 seconds. Click “SELECT FILE” and point to the dsp spectrum file of the reference sample; then fill in the fields Crush Date, Vintage, Varietal and Appellation and click the “REF?” button to get the checkmark. Click another line of “SELECT FILE” and point to the dsp spectrum file of the test sample; then fill in the fields Crush Date, Vintage, Varietal and Appellation. 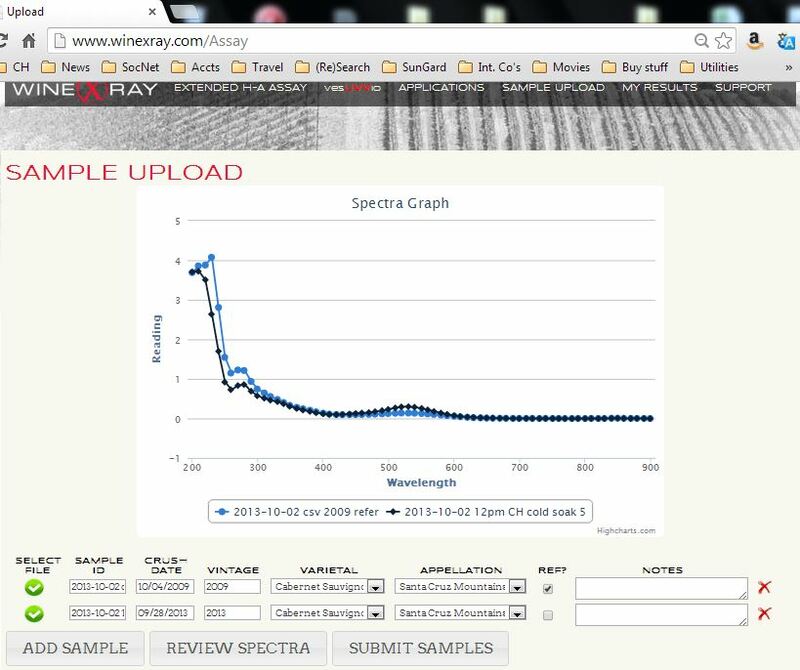 Click “Submit Samples” and within a minute you get the phenolic profiles back. Click “Email” to send the results for filing. Monitor the ageing of wines in the cellar. The chart (adapted from a WineXRay presentation) shows the level of anthocyanins over 4 years. By the end of 2014 we had completed 2 fermentations with detail recordings of phenolics and monitored 3 vintages through the cellaring process. The following graphics show the evolition of phenolic measures across vintages plotted over time (measured for each vintage in days since harvest, on a logarithmic scale). The differences between the vintages are astounding! 2013 (dark blue line) was clearly a vintage with much higher phenolic (+40%!) content than 2014 (black line) and 2012 (light blue liine) which look similar in the end result but we don’t yet have enogh comparative data. By comparison 2011 (red line) was a very weak year although we only have phenolic data very late in the wine making process. The obvious question is how can grape growing and wine making be improved to get better and more balance phenolic production and extraction.